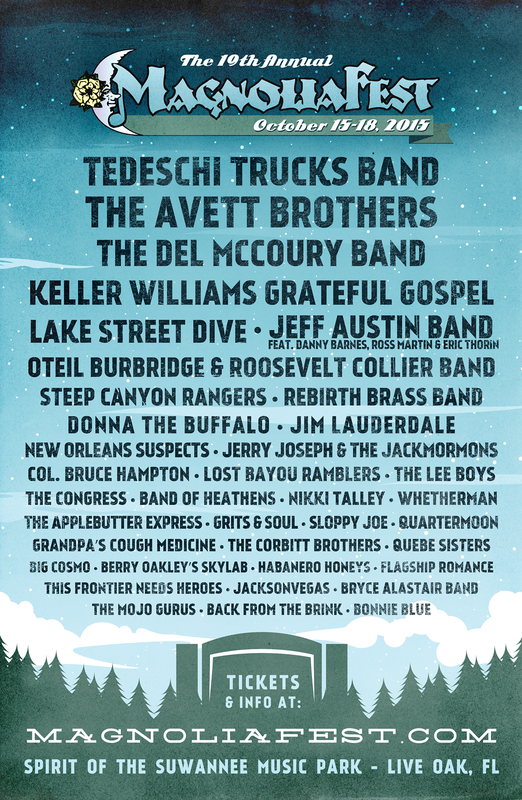 Magnolia Fest 2015 Lineup Additions: Del McCoury Band, Jeff Austin Band, Oteil and Roosevelt, Rebirth Brass Band, Jerry Joseph and more! Magnolia Fest celebrates its 19th year at the magnificent Spirit of the Suwannee Music Park in Live Oak, FL on October 15-18, 2015 and is thrilled to announce a handful of additions to this Fall’s lineup including The Del McCoury Band, Jeff Austin Band featuring Danny Barnes, Ross Martin & Eric Thorin, Oteil Burbridge and Roosevelt Collier Band, Rebirth Brass Band, Jerry Joseph & The Jackmormons, New Orleans Suspects, The Congress, Band of Heathens, Nikki Talley and more! Festivalgoers enjoy four days of camping and live music, arts and crafts, and a selection of great foods. Magnolia Fest consistently features some of the world’s finest performers in Americana, Roots Rock, Acoustic Blues, Singer/Songwriter, Bluegrass & Newgrass, Cajun/Zydeco, New & Traditional Folk and other forms of American Roots music. This energetic and family friendly musical celebration is a gem of a festival with a great lineup, beautiful fall weather and a stunning natural setting. The Live Oak Music And Arts Foundation (LOMAF) will have a booth with raffles to raise money for the local music and art programs in the area. Get your tickets early and save! Tickets for Magnolia Fest are on sale now in advance for $175 through July 19th; $185 until August 20th; $200 until October 14th; and $210 at gate. All weekend tickets are inclusive of all taxes and fees, and include 4 days of primitive camping and music. Kids under 12 are invited to join for free. Fans can also upgrade their experience with VIP tickets for $350 through 8/30 ($400 after that) which includes dinner, discounts, VIP Lounge, festival poster, & other perks. For RV hook ups, cabin rentals and golf cart rentals, please call SOSMP at (386)-364-1683. For further information and tickets, please visit www.MagnoliaFest.com. Spirit of the Suwannee Music Park, located just north of Live Oak, FL, is a one-of-a-kind music park and premier 500+ acre campground nestled on the shady banks of the historic, tea-colored Suwannee River in North Florida. Along with the camping, there are nearly 12 miles of trails suitable for hiking, biking, horseback riding and nature exploring. Bring along a fishing pole and wet a line from the dock on Rees Lake. Canoe and bike rentals are available at the on-site canoe outpost. Or take a dip in the nearby Suwannee Springs. SOSMP is located between Jacksonville, Florida & Tallahassee, Florida about 30 minutes south of the Georgia State line, about 45 minutes north of Gainesville. Please visit the park’s web site at www.musicliveshere.com or call them at 386-364-1683 for more information. Stay up to date with Magnolia Fest news at www.MagnoliaFest.com, www.facebook.com/MagnoliaFestfl, www.twitter.com/MagnoliaFest, and www.instagram.com/magnoliafest.